Homemade butter? Yes, and trust me on this that it might change your take on butter. My oldest kid uses butter on a regular basis to sear up ham and buns, yep, he is into that and I don’t mind as he is exploring in the kitchen and cooking on his own. After watching a recent Vimeo video of this guy’s passion of making bread and butter, I decided that I was going to make my own butter. If you have never made butter before, try it. It was super simple, and you know what you are getting when you are making it yourself, and that is the beauty of it all. Yep, that’s how butter is made. Way to simple. I used a KitchenAid, however rumor has it that you can shake the crap out of the cream in a large mason jar. I support KitchenAid, so I went that route. Start by adding the heavy cream to the KitchenAid bowl. Place in the mixer, and spin on medium to medium-high spin for about 10 minutes, keeping an eye on it along the way. After about 10 minutes, possibly sooner, the cream begins to curdle and separate. It’s cool, it’s really cool. Once it separates, turn off the mixer. Strain the liquid from the solid. You can reserve the liquid should you desire. 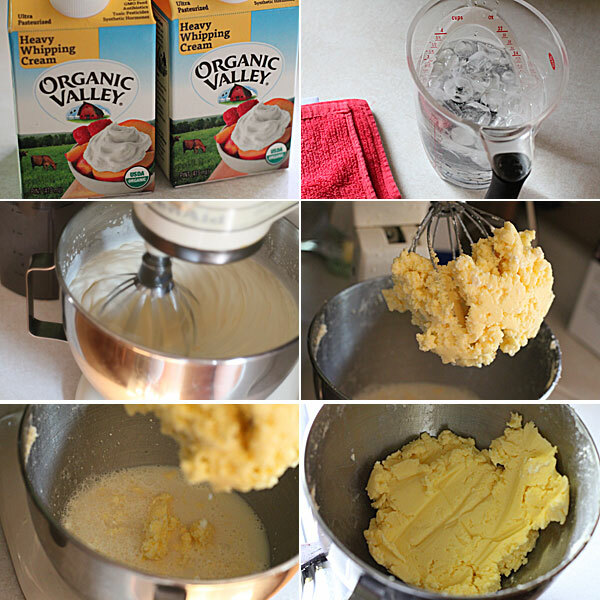 Once the liquid has been strained, return the solids back to the mixer. Add in the ice cold water, and continue to mix until you have a tight, solid mixture. Drain the excess water. Once you think the liquid has been strained, it has not. Use a large wooden spoon and press the butter against the bowl. Lots of liquid will come out, trust me. Continue until you know that all of the liquid has been removed. I ensured this by placing the butter into some cheese cloth and tightening it until all of the liquid was removed. Now you can add salt if you desire. I added about half of a tablespoon of course Kosher salt. You could add Sriracha salt as well. Give a gentle stir, and save in a sealed tight container, in the refrigerator. The end result is a great, really great butter. I haven’t seen my wife spread butter on a bagel in some time, and she was all over that. We spread it on corn, as well as seared up some ham sandwiches. Give this a shot if you want some really good product, and remember, use organic, I think that makes a huge difference. So you used a full quart of cream? How much butter did that make? Micah – this made close to 2 cups of great butter.